The Lawrence women’s soccer team has been a fluctuating power team in the NCAA Midwest Conference that we currently reside in. 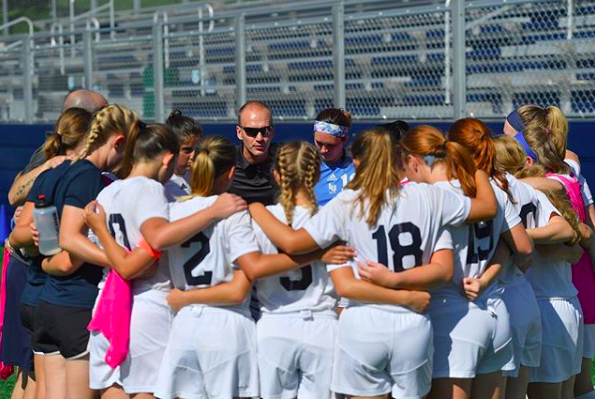 Although Lawrence soccer has won the Midwest Conference Championship several times in the past, the team’s record has changed rapidly over the past 10 years. The seasons have gone from celebrations over winning the Midwest Conference championship to celebrations over winning a single game during the season. Over the years, low recruitment numbers have cost the team dearly, forcing the team to recruit incoming students from Lawrence who hadn’t played soccer in years. At certain points, the women’s soccer team didn’t even have enough healthy players to field a full eleven players during games. It was an all-time low for the team. 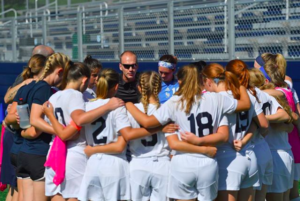 However, both Lawrence Athletics and the members of the women’s soccer team have refused to let this continue, and last spring, Joe Sagar, the former assistant coach at Augusta College, was hired as the new head coach for the women’s soccer team. With new leadership in place for the women’s soccer team, the team is now heading in a new direction. Coach Sagar, with a strong 5 year plan and sense of purpose for the team in his new position, has raised the pressure for the team. Although Sagar didn’t come in time to contribute to the newest recruitment class for the 2018 season (which consisted of 3 new players), he is already making an impact. In the past, our team did not just have trouble with recruiting players, which created trouble for maintaining the team, but we also had trouble getting along with each other. There was so much conflict among the team that the environment was a tough place to work together as a good team. The players were stressed and angry among themselves. However, with Coach Sagar has our new head coach and a new team mentality in place, the environment has changed drastically. The feeling and motivation in the team has done a complete 180. Both in the fall season, and in the off season, our team is supportive and continues to push each other. The winter, while we do not have practices, we do have lifting three times a week, as well as several captain-led indoor sessions. It can be quite hard to get up at 5:30 am for lifting three times a week, but our team continues to push each other. We hold each other accountable when someone might not be putting in the level of work that is required, both in the weight room and the classroom. When the search for our new head coach was occurring, the players on the women’s soccer team knew that we did not want to continue to lose. We were tired of being short on numbers and always losing, and we wanted to become a bigger team than that. We know that Coach Joe Sagar can lead us to that, and he is. As soon as the fall season ended this year, our coach has been on the road recruiting players for the upcoming 2019 season, while back at Lawrence, us players are pushing our limits both academically and physically. The Lawrence women’s soccer program is not willing to sit on the sidelines any longer. We are fired up and ready to make an impact on the Midwest Conference, and the NCAA D3, that will not be forgotten. Previous post: All About the Lawrence Meal Plan!